This unique and fascinating dog is of Chinese origin and is steeped in oriental mystery. Chow Chows have retained their individuality and distinctive appearance since 150 BC and early records show it was used by the Emperors as guard dogs and hunters. 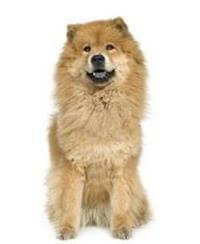 The Chow Chow as we know it first appeared in England in 1781, but they did not gain prominence until a century later. Perhaps the most distinctive feature of this medium-sized dog is its blue-black tongue – a feature it shares with the bear. Chow Chows usually live to eight years of age, but will live up to ten years if cared for properly and fed the right diet. Kept healthy, a typical female should weigh 23kg and be 45cm tall while the male should be 32kg and 50cm in height. The Chow Chow has a characteristic scowl that is often read as a sign of meanness, but this is far from the truth. The Chow Chow is a happy, independent and devoted dog. It does not fawn over everyone who knocks at the door, but saves its affection and playfulness for its family. It is a quick learner and extremely intelligent. For maximum harmony in the home, this dog should be introduced to other animals at a young age. As with most breeds, an older Chow Chow should be supervised when introducing it to other pets to ensure there are no disagreements. For best results, the Chow Chow coat requires regular brushing and combing. Frequent brushing will help with housekeeping as the coat is shed several times a year. They are usually a very clean dog that has been known to wash their face after eating. Although the Chow Chow likes space to run, it will adapt to most homes provided owners are willing to take it for regular exercise.